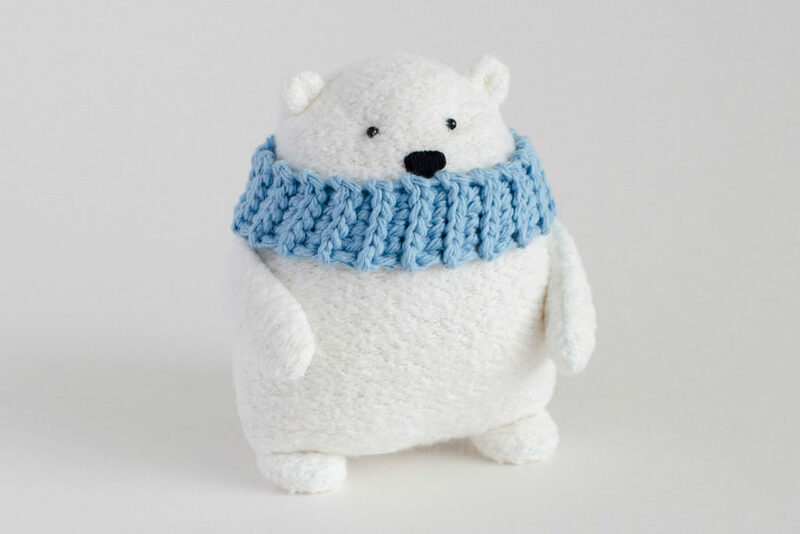 It’s Polar Bear Week and also time to start thinking about holiday crafting! If you’re looking for the perfect DIY gift for kids, that special someone, or even yourself, look no further! Mr. Foofs the Polar Bear free sewing pattern comes in two sizes and can be sewn by hand or on the machine. 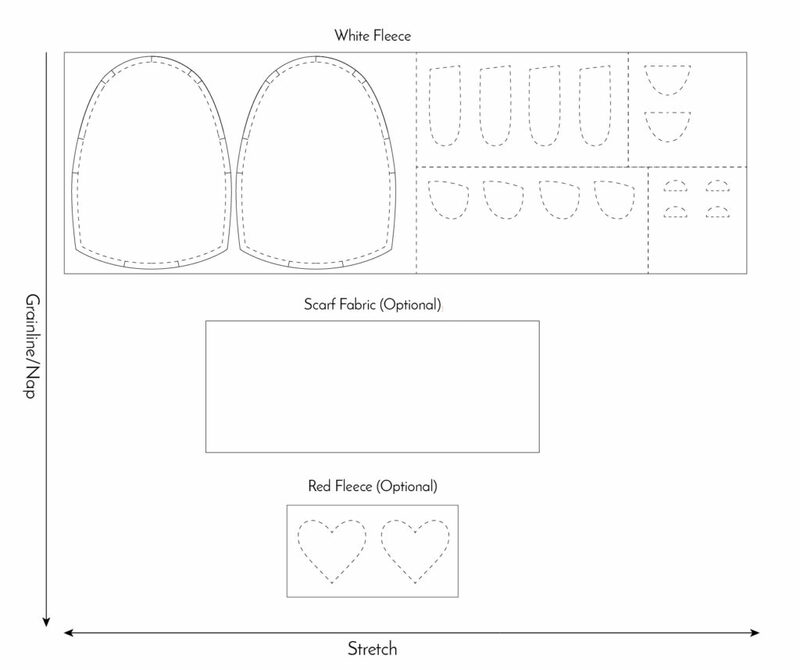 Mr. Foofs can be made wearing a scarf or holding a heart, and I’ve included instructions for sewing or crocheting the scarf. Both polar bear sizes are made using the same steps with a few minor exceptions, which are explained below in the tutorial. If you sew your polar bear with natural fleece, I recommend using a 90/14 ball point needle; and if you sew with organic cotton thread, I recommend making your final stitch a stretch stitch (a stretch stitch is fairly permanent, so baste first when needed). Cut out pattern. I find it easiest to trace the stitch line for small pieces and sew on folded/layered fabric, so I’m using the arm, leg, ear, and tail pattern pieces with only the seam allowance at the very end (see first photo under ‘sewing the ears, arms, and legs’). Cut ear, arm, leg, and tail pattern pieces so only the seam allowance at the very end remains. Stitch around ears, tail, legs, and arms. Cut out with 1/8″ seam allowance. Turn ears right side out and run hemostat clamps/turning tool around the seams. Fold outer edges of ears in toward the center at indicated markings. Baste stitch again to hold ears in folded position (you may need to baste by hand if making a tiny polar bear). Cut out arms and legs with 1/8″ seam allowance and turn right side out. Run hemostat clamps around the inside seams to help them fully open. Stuff arms and legs about 2/3 full. If making a full-size bear, you can make the eyes and nose with felt and machine or hand-stitch them 1/8″ from edge. If using the sewing machine to stitch in place, you will need to stitch them on before going any farther with the tutorial. If making a full-size or tiny polar bear, you can use a satin stitch for the nose and make embroidered knot eyes with embroidery floss or yarn (here’s a video tutorial on embroidering eyes with a French or colonial knot). This can be done before or after stuffing depending on your preference. If making a full-size polar bear, you can use a plastic safety nose and eyes. Note that safety eyes/noses are not intended for small children, and I do not recommend using them with natural-fiber fabrics, like organic fleece. (Safety eyes typically require a small amount of fusible stabilizer or Fray Check to prevent holes in stretch fabrics.) Inserting safety eyes/noses can be done at this point or right before turning the polar bear right-side-out. With RIGHT sides together, stitch polar bear front to polar bear back, making a U-shape with openings for ears and arms. Insert the ears and arms. Make sure the insides of the ears are touching the body side with the face (see ‘inside view’). Since the ears are tiny, I recommend baste stitching them in place and turning the polar bear right side out to check their position before making your final stitching. Turn polar bear right side out (if you haven’t made your eyes or nose yet, make sure you have their positions marked on the right side of the fabric before stuffing). Stuff the body firmly. Be sure to stuff the corners above the legs well, and continue stuffing as you close with a ladder stitch (you’ll want to use white thread, but I used colored thread so it would be visible). Here’s a video tutorial on how to ladder stitch. Remove basting stitches after closing the opening. 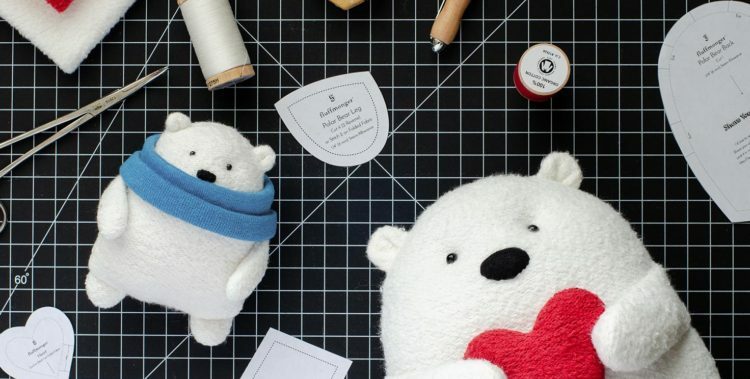 Finish your bear with a cute scarf or heart. See directions for both below. For a full-size bear, cut an 8.5-in by X*-in piece of fleece or jersey knit fabric with the longest dimension along the cross grain (so the cowl can stretch when going around the neck). For a tiny size bear, cut a 3.5-in by X*-in piece of fleece or jersey knit fabric with the longest dimension along the cross grain (so the cowl can stretch when going around the neck). Slip over polar bear’s head and the top of arms to hold them down. Scrunch scarf a bit. For the following rows (you may need more or less depending on the stretch of your fabric and how much you stuffed your bear), double crochet BLO (back loop only) in next 22 stitches, chain 2, and turn work. When you get to your final row, either slip stitch the two ends of the scarf together or fasten off and sew ends together. Slip over polar bear’s head and the top of arms to hold them down. For the following rows (you may need more or less depending on the stretch of your fabric and how much you stuffed your bear), single crochet BLO in next 6 stitches, chain 1, and turn work. When you get to your final row, fasten off. Attach heart to polar bear’s paws using a ladder stitch. 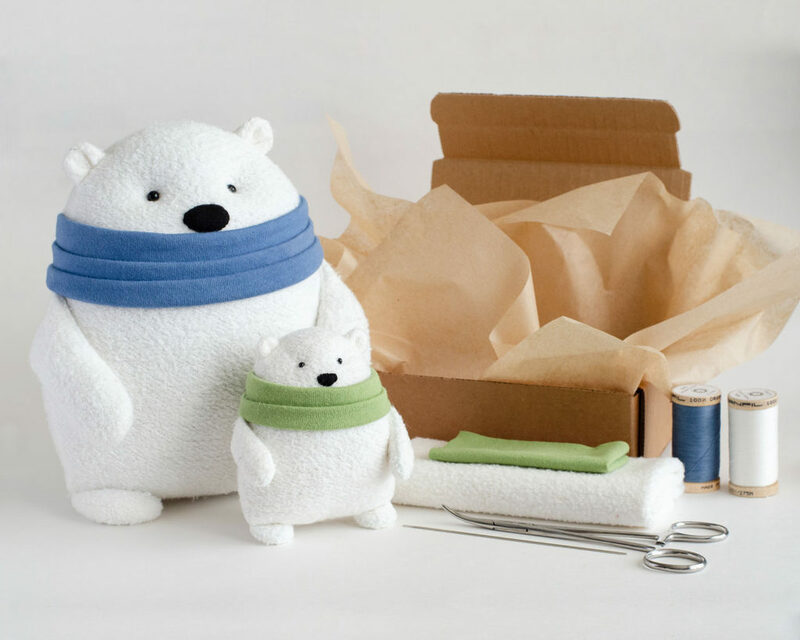 If you’d like to try sewing a polar bear with organic fabric, I have fabric kits available with just the right amount of hand-dyed organic fabric to complete the project. I also have Pick 2 Kits for sewing both a full-size and a tiny polar bear. Show Me Your Polar Bear! Thank you for sharing this pattern. I’m going to use it to make toys for children for the local Christmas toy drive. That warms my heart, Debbie! Thank you so much for spreading kindness in the world! I’d love to see what you make if you’d like to share photos! Thank you so much, Carla. He’s adorable. This is so dang cute!! Thank you so much for sharing…and for all the clear instructions and helpful videos…very much appreciated! Thank you, Connie! I’m so glad you find them helpful! You’re so welcome, Audrey! Enjoy your holiday crafting! Hi, Beryl! It’s possible your internet browser is redirecting you to the same page. I’m not sure why this happens with certain browsers, but opening the page in a different browser seems to have solved the issue for others who have experienced the same problem. Thanks so much for this pattern. I am going to make it for my 5 year granddaughter who has Rett Syndrome. A lot of Kids with Rett Syndrome like to mouth everything. My girl can put this in her mouth and I won’t have to worry about what is in then material or parts coming off. You’re so welcome for the pattern, Robin! I’m sure your granddaughter will love what you make for her. I’m glad the pattern and tutorial can help you in making a toy that meets her needs! Hi tkanks for your all of that sent .lfind them very nice good luck. Merci pour ces magnifiques petites peluches si mignonnes et puis merci aussi pour ce tuto si bien fait !!!!!!! You’re so welcome, Dominique! Thank you for your sweet message! I hope you enjoy the patterns! Hi! I would want to make this for my mom this christmas (It’s just so damn cute), but I’m not sure how to make the nose.. Do you have any tutorial or anything that shows, how to make it? Hi, Regitze! Thank you so much! I show how to embroider a nose using a satin stitch in my otter tutorial video at 1 hour 6 minutes https://www.youtube.com/watch?v=yW7QxKB1JrU&t=128s. Hope that helps! Thank you so much, Majda! I’m glad you like them!